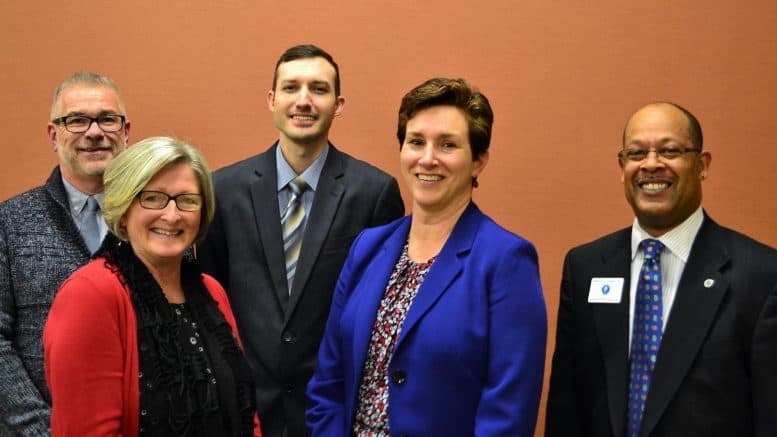 Washington County’s five Democratic candidates seeking election to the Board of County Commissioners participated in a Wednesday-evening forum that was organized and hosted by the United Democrats of Washington County. The five Democrats include 911 dispatcher and 2014 commissioner candidate Brian Beall; former Washington County Board of Education member Donna L. Brightman; former Board of Education member W. Edward “Ed” Forrest; United States postal carrier Harry Jones; and Frederick County Public Schools educator Elizabeth Paul. Former Washington County Commissioner Linda Irving-Craig moderated the commissioner forum, offering the five Democrats three minutes each to introduce themselves to the crowd of more than 60 gathered in the community room at The Alice Virginia and David W. Fletcher branch of the Washington County Free Library in downtown Hagerstown. United Democrats of Washington County (UDWC) was formed in 2015 as an activist, grassroots organization to revitalize local Democrats and take political action on the local, state and national levels, according to its website. All five Democrats will advance through the June 26 primary and into the November general election. A sixth candidate would have triggered a Democratic primary. Paul said she has heard from Washington County business people that “it’s really hard to start a new business” and that the county has been reluctant to help business owners get their businesses off the ground. She said though that the major interstates in the county are causing drug and human trafficking issues. Harry Jones said Washington County has to “get back to the EDC” but lamented the county for not pushing hard enough to attract new businesses. Forrest agreed with Jones, saying that Washington County needs a more transparent economic development plan. She suggested that the county issue sustainable microloans to small businesses so as to help them expand and hire additional employees. Beall agreed with Forrest in that Hagerstown and Washington County must work better together to drive economic development. Candidates were each asked about their position on promoting renewable energy. “That’s a good question. If there is a niche for bringing renewable energy jobs into Washington County, I think that’s a great idea, Forrest said. Forrest was not confident in the county’s ability supporting renewable energy, telling the audience that Washington County “will have to move in that direction as technology progresses and be prepared for it.” He said that he’s not sure if the county is on the “cusp of that” at this time. Beall said that Washington County could get its county commuter buses involved in “cleaner fuel technology.” He suggested county buildings being tied into the solar grid. Brightman pondered giving a tax incentive to a startup company that works to develop a newer approach to solar or biopower. Paul said the county should encourage renewable energy businesses and attracting new businesses in the future. Jones suggested the county look more toward agriculture with respect to solar power. Paul said the county should revisit its harassment policy. Paul said that county employees who are harassed should not be reporting to the county attorneys because the attorneys have a duty to the county, not the employee. “Leadership has to come from the top,” Paul said. Beall suggested an independent board – at least three individuals – look at sexual harassment complaints – separate from the county commissioners. Brightman said that the county’s human resources department is not there to protect county employees but rather protect management. She said county employees should have access to a hotline “that is totally independent of the HR departments.” Brightman further pushed for an independent ethics panel, one in which the county commissioners do not appoint the members. Forrest, who works in the private sector as a pharmacist, said that his workplace has annual training on sexual harassment. 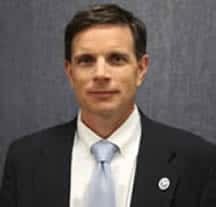 “It should be done on an annual basis.” He pushed for an outside agency to conduct investigations. “We can’t have HR meetings in a parking lot in a car. That alone is enough to revamp the entire HR policies. Jones also advocated for a confidential hotline for employees to call, likening it to the policy in place at the post office. All five candidates oppose the plan. A Miner Detail has exclusive video of the forum. This year’s Republican commissioner primary is hotly contested. 13 Republican candidates will compete in the June 26 primary, including incumbents Terry L. Baker, the current president of the commissioner board; Jeff Cline, the board’s vice president; and Wayne Keefer, who was appointed to the board in 2016 by the Republican Central Committee to fill the seat held by the late Vincent G. “Woody” Spong. The late Spong resigned his seat in January 2016 after Gov. Larry Hogan (R) publicly called on the Senate Executive Nominations Committee to pull Spong’s nomination from consideration. Embattled Commissioner LeRoy E. Myers, Jr. is not seeking re-election. Former Washington County Assistant County Administrator Sarah Lankford-Sprecher accused Myers of sexually harassing her during a 2016 business development trip to South Korea. Myers is now locked into a prolonged legal fight with Sprecher, who is seeking damages in Washington County Circuit Court. Two commissioners admitted that Myers kissed Sprecher; Myers, however, denies that he sexually harassed Sprecher. Commissioner John Barr is seeking re-election to his fourth term, but not as a Republican. Barr recently left the Republican Party and will run for the commissioner board as a registered Unaffiliated, which is Maryland’s version of an Independent. Former Washington County Commissioner William “Bill” McKinley has also left the Republican Party and is running as an Unaffiliated candidate for county commissioner. McKinley was first elected as a county commissioner in 2010. He was defeated in the 2014 Republican primary.